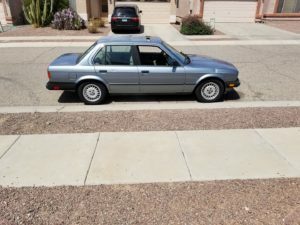 Recently I purchased a 1985 BMW 325e on craigslist for 1000. It wasn’t running. The previous owner had lowered it with mismatched parts. I had to have it towed home and contemplated how to fix it. The previous owner had told me that the fuel pump was bad and that’s why it wasn’t running. After some inspecting, this was clearly a lie. This E30 was not in the best condition. It had various dents and scratches. The paint was not to bad for the age. The interior was fair except for the front E30 comfort seats which were in horrible condition. They were ripped. shredded and very uncomfortable. As a new BMW fan, I was eager to fix it up and get it on the road. I would spend many hours researching parts and upgrades. My plan was to rebuild the engine with a turbo and fix up the car to show worthy condition. I knew I was in for a long project. My 1985 BMW 325E e30 I like the color. 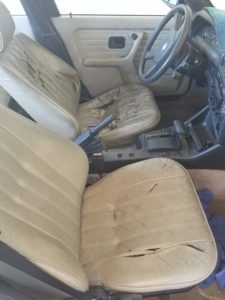 The gross wrecked e30 comfort seats. It makes driving a bit uncomfortable. The back seats are a bit better. My work in progress. Slow and steady. 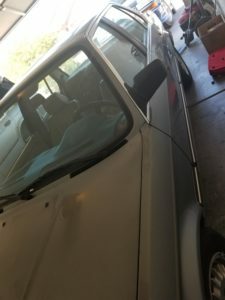 The first thing I did was purchasing another BMW E30 for parts and a new fuel pump. Not only was the fuel pump bad but the flywheel reference sensor was also bad. My research had found that the fuel pump would not activate if these sensors are bad. With these parts changed I was able to get it started. It is a huge ego boost when you purchase a car that isn’t running and bring it back to life. I was able to drive it but it still had quite a few issues. The exhaust was leaking and needed to be replaced. The engine was sluggish, I am unsure if it’s the Getrag auto transmission or clogged cat. The seats are in horrible condition. 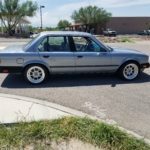 While reading about the E30 I had come to the realization that I had purchased the slower more fuel efficient E30 the 325e. The E30 debuted in the U.S. in 1984, replacing the E21, the first 3 Series that has aged well in the looks department but is largely considered inferior to the legendary 2002 that preceded it or the one that came after. The E30 was sold in two flavors at first in America: the four-cylinder 318i, and the six-cylinder 325e. Other variants like the 325is and M3 came later, and we’re just talking about the U.S. market for now. That’s important. BMW has always been famous for its smooth, powerful, high-revving inline-sixes, but the 325e is kind of lacking in the last two departments. It’s powered by what is called the “Eta” engine, a stroked-out 2.7-liter variant of the famous M20 inline-six. The e stands for efficiency, and Eta is Greek for the same. It’s all very logical. The Eta engine was designed to be the kind of car BMW figured Americans wanted at the time: low-revving, high on torque, low on horsepower, not unlike a V8 from the era. It was also meant to be a more fuel-efficient option. It’s rated at an unusual 121 horsepower and 171 lb-ft of torque. I decided on a possible engine swap. I also do an auto to manual conversion. 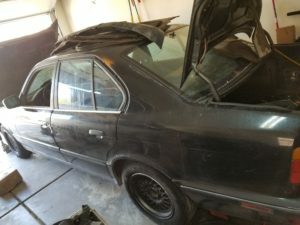 I found a worn and decaying 1993 BMW 535i with an M30B35 engine with manual transmission. I purchased it for $300 and the guy was nice enough to tow it to my place too. The 1989 BMW 535I m30b35 is a popular choice for engine swaps and I couldn’t beat the price. Although the 535i was in bad shape the engine was turning over and appeared to be in decent shape. I was able to sell some of the unneeded parts and get the engine almost free. There were also a set of used racing seats that I plan to use in my project or another. Maybe I’ll just sell them. My plan is to swap the m30b35 into the 1985 BMW 325e. Ill sell the m20b27 engine and auto transmission and recoup some money. I might be in over my head but I like a challenge. Overall I’m happy with the purchase and wish I could drive it more often. 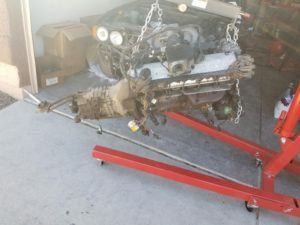 I can’t wait to get it up to par and complete the BMW M30B35 engine swap. Further down the line also doing a turbo set up. My power goals are about 400 wheel hp. From my research this is possible. 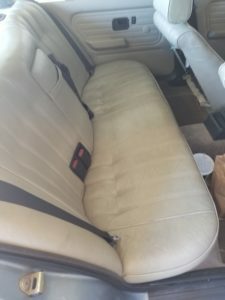 I want to really redo the interior and reupholster the seats too. I think I might get a pair of sport seats to swap out. I’m still undecided. 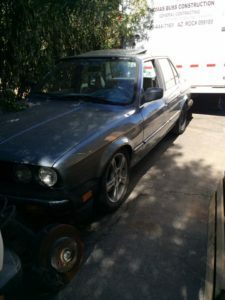 It might be better to sell this one and find another BMW E30 that will make the engine swap easier. The E30 I purchased is the older model with the square c101 plug and a auto transmission, which make the upgrades a bit more challenging. I’m confident I’ll be able to do it. I do like the color of the car. A BMW m30b35 engine and Getrag 260 transmission I pulled from a 1989 BMW 535I. My next plan of action is to get the exhaust that I pulled from a parts car e30. Hopefully, this will solve my issue with loss of power. If that doesn’t work I will research other areas of attack. I’m hoping I can fix it up enough to pass the state emissions test. Then I will probably just start the engine swap. My other option is to sell it and do the swap on the parts car but that one has some front-end damage. 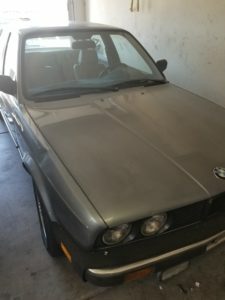 My third option is to sell both and find another e30 with the sport seats and manual transmission so I can do the swap in that without all the extra work. Id really like to put it on bags and pimp it out but I’ll need to be patient and take it one day at a time. To be continued…..